Emotions influence so much of what we do in life, positively and negatively. The way we feel inside directly affects the way we feel about the world outside—and usually how we feel about ourselves. This can influence our interactions with others, decisions we make and our overall success and happiness in life. You’ll know exactly what I’m talking about If you’ve ever started the day off angry—or in a bad mood. Those negative feelings can spiral throughout the day until all you are left with at the end are the remains of a really bad day full of negative experiences and a lot of wasted time. On the flip side, if you’ve ever left the house in a truly joyful mood, you might have felt that positive energy touch every aspect of your day, including the people around you, making your experiences truly incredible and memorable. Because of the great power of our emotions, it’s so important to fill our days (and nights) with as many positive ones as we can. For more than 48 years, Schweitzer Linen has been helping people experience the very best feelings every day through luxurious fabrics, exclusive designs and creating the right environment to inspire positivity and happiness—from the second you wake to the moment you rest your head. We didn’t start our family owned company just to change your bed, we started it to change your life. And here are some ways you can. These collections will evoke the kind of powerful, positive feelings we can all use more of in our day-to-day routines. Everyone is looking for happiness. It’s the ultimate goal we are trying to achieve most of our lives. At Schweitzer Linen, we’re dedicated to filling your world with happy moments every single day and night. The happier you feel in your bedroom, the more likely you are to carry those feelings outside and into your everyday life. And when you are truly happy, nothing in this life is impossible. This is how everyone should start and end every day. 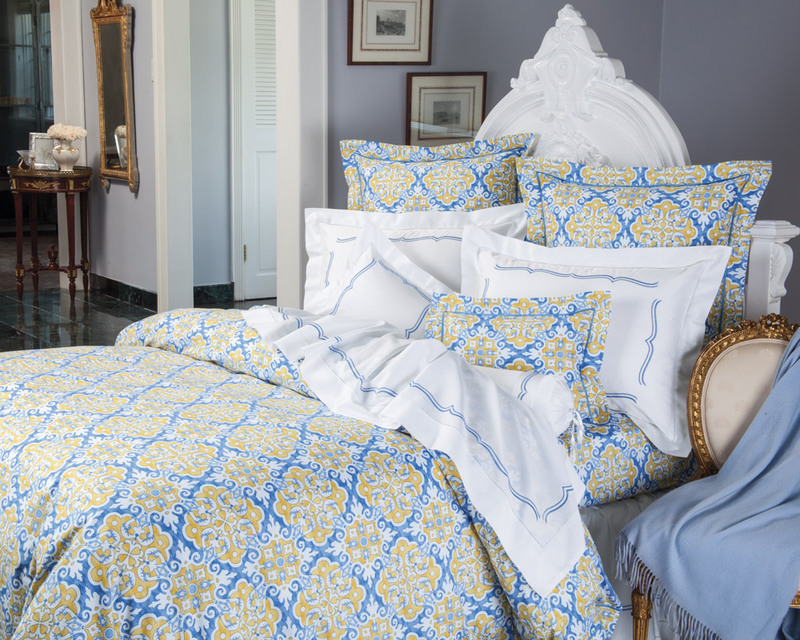 Our Aquarius collection is bright and cheery with joyful yellows, blues and whites on satiny smooth 300-count Egyptian cotton sateen and distinctive blue bourdon stitching. One look and you might find it hard to stop smiling. Want to wake up happier? 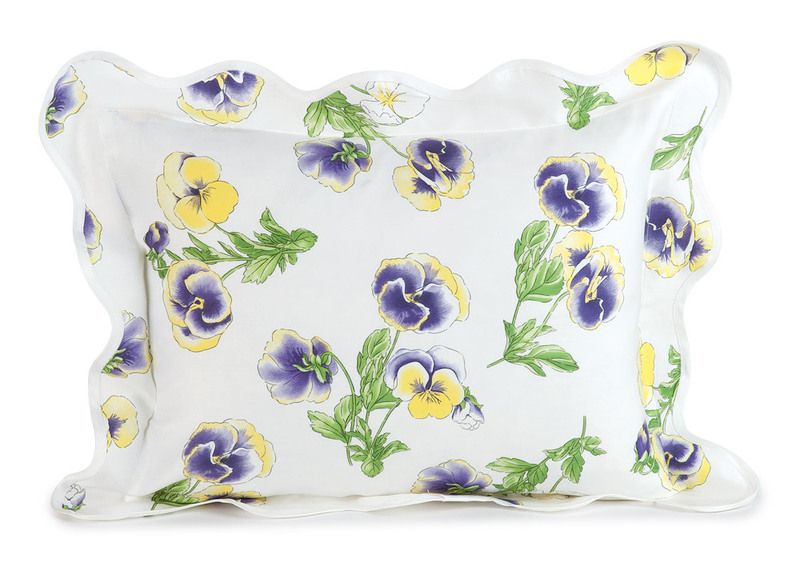 Rise and shine with our Pansies collection. It feels like someone gathered the world’s most robust purples and sun-shiny yellows and put them together in a bouquet designed especially for you. Gently scalloped edges are taped in white satin for an elegant ﬁnish. Made in Italy on silky soft 300-count 100% Egyptian. Or you can start all your mornings’ sunny side up with our Lakeville collection. The vibrant optimism of soft Yellows and pure White is like a perfect afternoon on a daisy-covered mountainside. 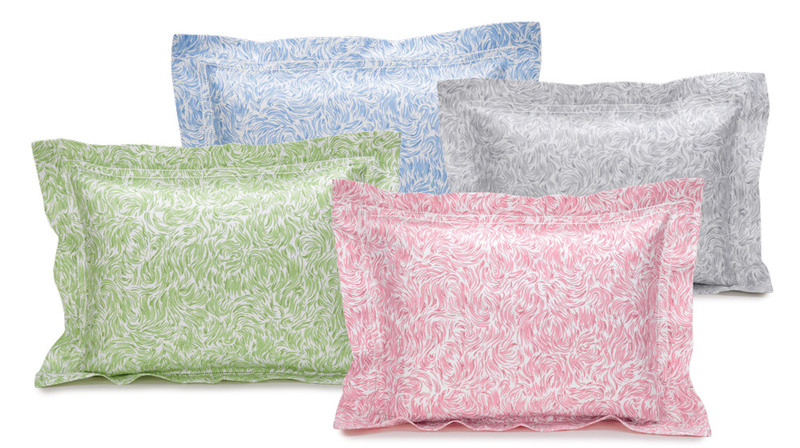 300-count 100% Egyptian cotton sateen is finished with scalloped edges and button enclosures. When you’re truly at peace, everything seems better, more manageable, more possible. Whether it’s starting the morning beautifully content or ending your night in the sweet bliss of your own personal sanctuary, these are just some of the collections that can help you get there. Crafted in Italy with swirls of Gray, Green, Pink or Blue and a double row of hemstitching on finely tailored borders, our Sweet Afton collection flows like a gentle river, soothing, calm and content. The trickle down effect will be just as good. 300 thread count Egyptian cotton sateen. With striking Art Deco opulence, the overlapping embroidered lines of our Canton collection create a restful geometric design that instantly calms everything around it—including your busy mind. Precisely tailored in Italy with a straight flange, mitered corners and delicate zigzag stitching. Available in Mist Green and Rose or Black and Gray, on pure White 600 thread count Egyptian cotton percale. Be completely at ease every day with the soothing and sweet ambience of our Ipswitch collection. 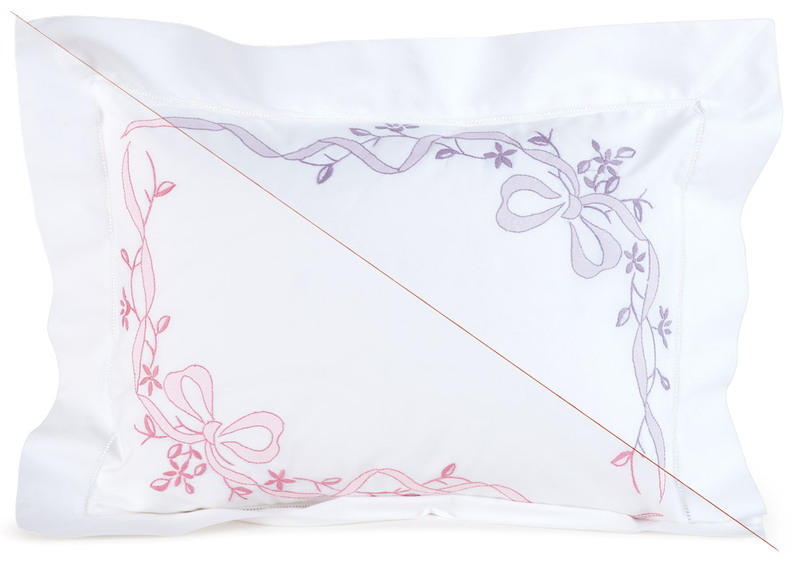 Available in precious Pink or calming Lavender petals, tied with the elegance of a sleek satiny ribbon. 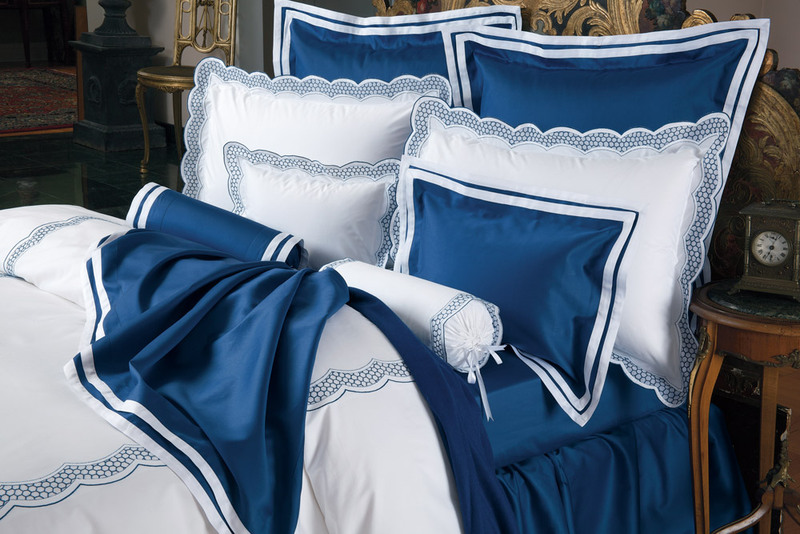 Crafted in Italy with scalloped edges, on soft, white 300 thread count Egyptian cotton sateen. What they say is true. Sometimes all you need is a good sleep and you can see everything with a different perspective. When you wake feeling energized and refreshed, the day takes on a whole new light, the world is full of possibilities and there is no wrong side of bed to wake up on. Our Solar collection fills your room and spirit with a modern burst of energetic golden links in a brilliant Orange or crystal Blue for immense mental clarity, purpose and personal power. Immaculate Italian tailoring makes it absolutely incredible, which is exactly how you’ll feel immersed in it. When’s the last time you woke up really excited to take on the day? Now you can every morning with the super-charged design of our Uffizi collection. Windy curls and silky swirls move constantly in a beautiful contrast of solid form and flow with deep bursts of colorful energy delighting at every turn. 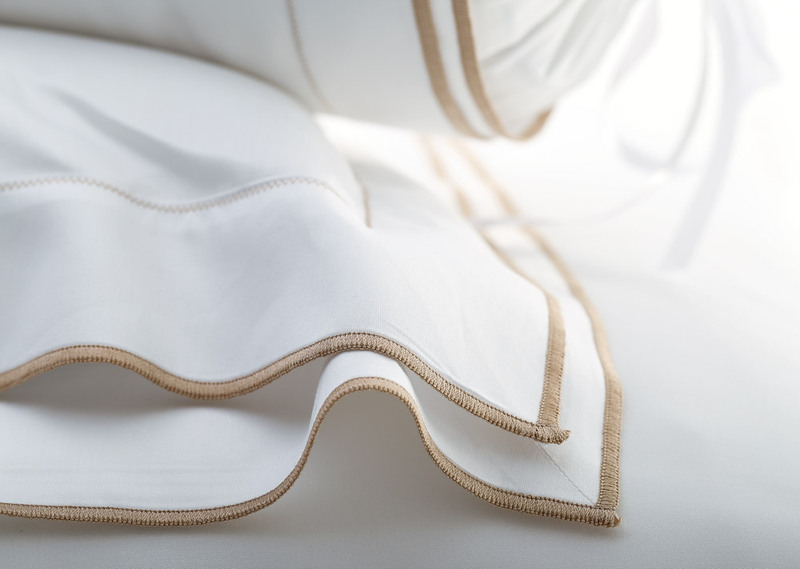 300 thread count Egyptian cotton sateen with bourdon stitching. Available in Gray or Smoke Blue. Our Deco collection is pure pizazz! You’ll love how the diamond-within-diamond design energizes your mornings and enlivens your evenings. 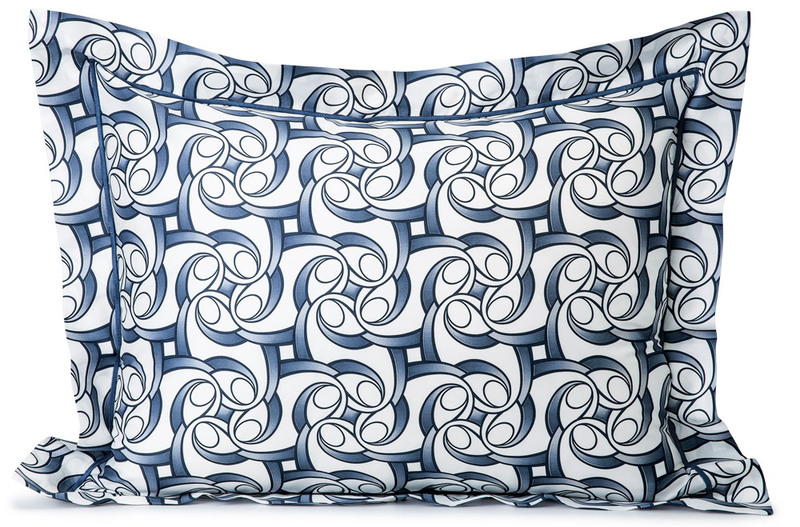 The luxe Art Deco pattern from Italy is embroidered on smooth 100% Egyptian cotton sateen and available in Navy or Beige on gleaming White. We truly believe that when you feel fabulous you are fabulous. Our bedding aims to make sure you always feel at your best so that everyone around will be sure to feel the same. Bold, beautiful and contemporary, our Chesterfield collection is the epitome of chic design. Steel Grey or Navy Blue Stripes on brilliant white 300-count Egyptian cotton sateen set a savvy and sophisticated tone that will make everything around you feel more refined and everything inside you feel as incredible as you really are. The stately Greek key and laurel leaf design of our Olympus collection features exquisite lines of impeccable embroidery within a frame of ultra-fine zigzag stitching that will bestow a dignified opulence to the bedroom and leave you in a luxe state of mind. Masterful Italian tailoring features knife-edged flanges and mitered corners. 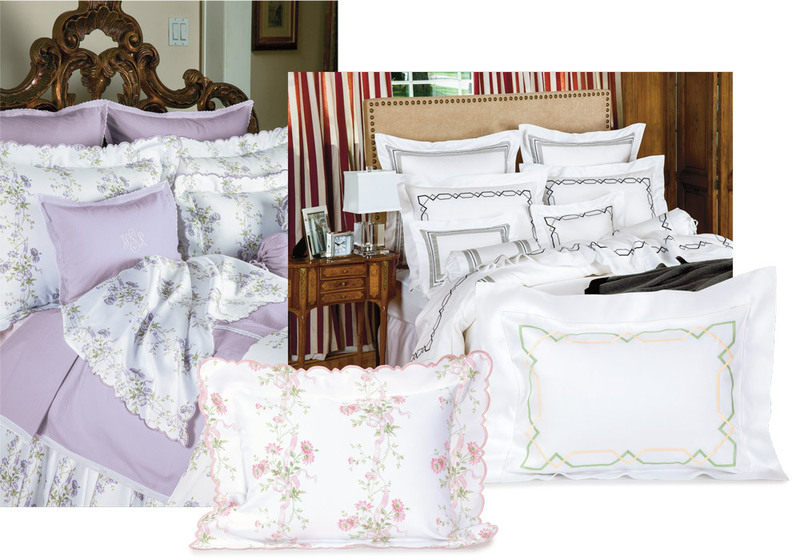 Available in Black/Gray or Mist Green/Rose embroidery, on pure White 600 thread count Egyptian cotton sateen. 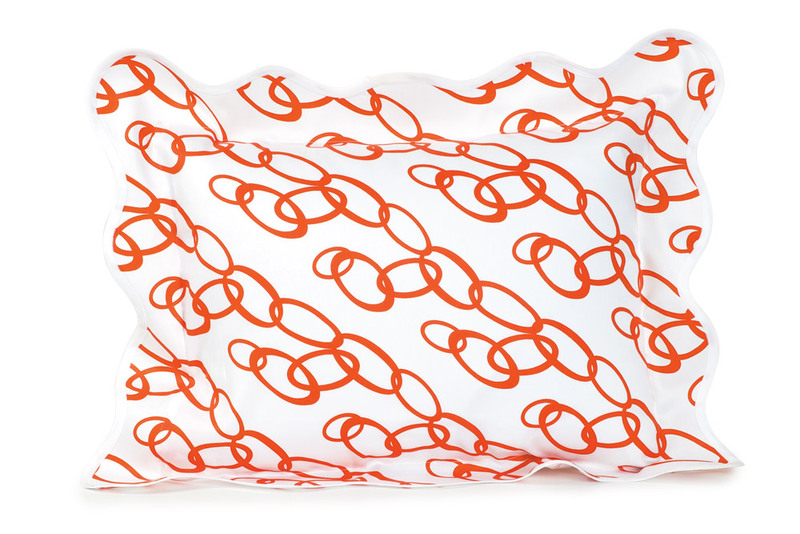 Maybe you shouldn’t need to be reminded of how fabulous you are but this bedding sure can’t hurt. Boasting an intricate paisley, in glowing shades of orange and green or a strikingly bold Black and Red, our Paisley Park collection embellishes lustrous, white 300-count 100% Egyptian cotton sateen with a delightfully regal presence. The straight border features orange taping, for a crisp, polished look. Our exclusive designs have inspired so many different people over the years — in so many different ways. And because inspiration comes in so many forms, we offer hundreds of exclusive inspiring designs. Here are just a few. 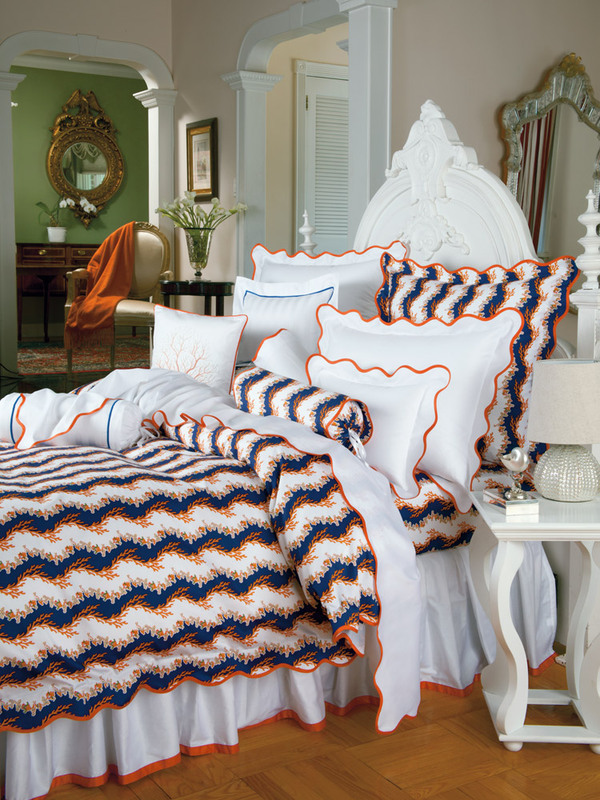 Our Gardner collection inspires moments of pure serenity with colorful orange coral and aquatic flowers rolling on rich waves of Navy and White on 300-count Egyptian cotton sateen. 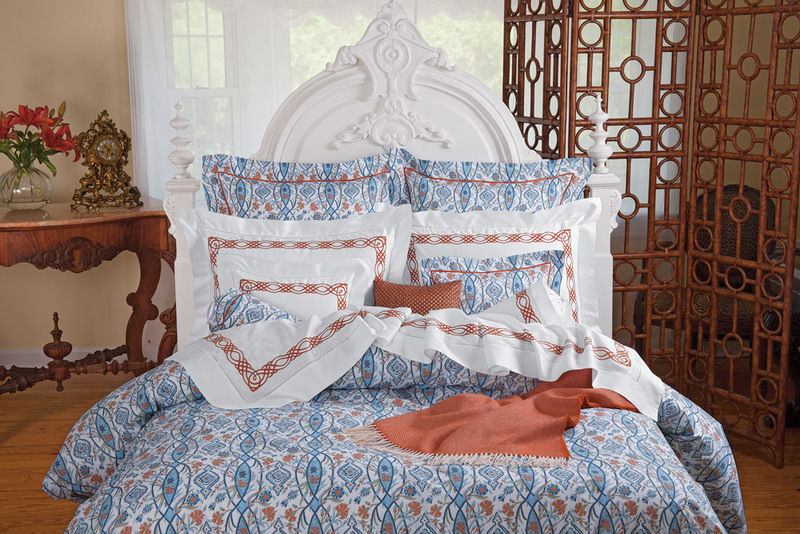 The majestic splendor of warm Terra cotta leaves on brilliant Steel Blue from our Logan damask bedding inspires a confidence and beauty you will carry into every day. And our contemporary Brooklyn collection will inspire more restful moments and compliments from guests with its sleek style, charming Gray/White tones and luxuriously convenient iron-free linen. The right bedding doesn’t just make your room look more beautiful; it makes you feel more beautiful. Waking up in elegant, refined linens and fabrics is a great way to start feeling more beautiful, confident and positive each and every day. Start doing this and you’ll quickly see how different your days become. 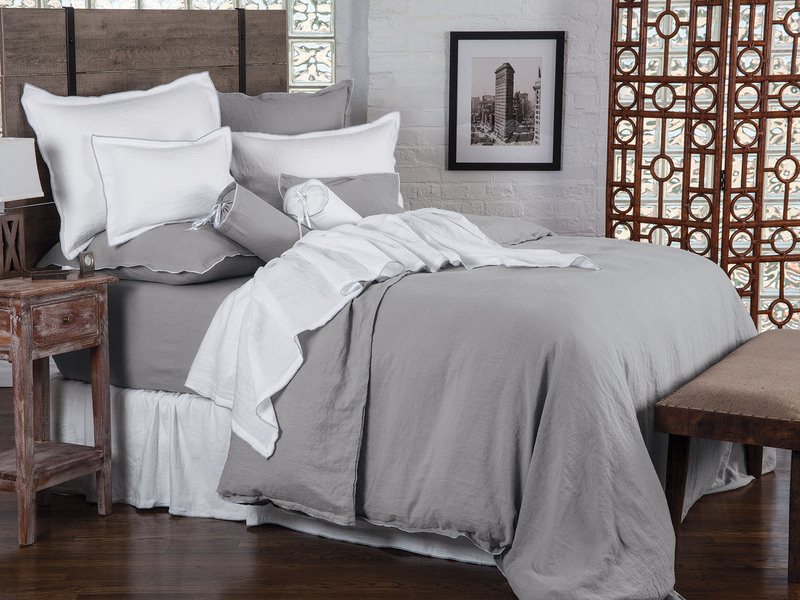 Start you mornings with our Fiocco collection, and let the sweet floral vines and flowing ribbons, shadow stitched by hand on 600 thread count Egyptian cotton from Italy, help you find more and more to love about yourself on the daily. Like the name suggests, our Vanity collection sees no reason to be humble. Double flange is finished with bourdon stitching on buttery soft cotton sateen with a twin border to frame the most important artwork of your life, you. 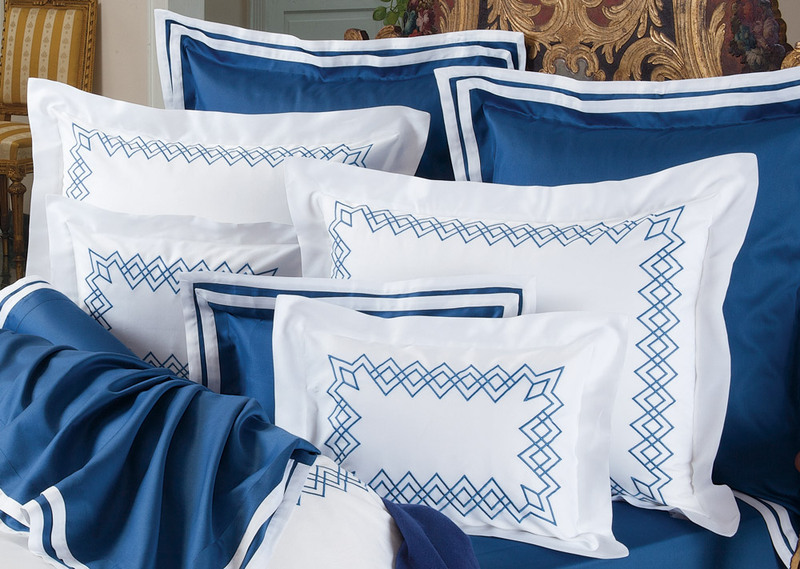 And if alluring is the goal, look no further than the stunning D’Abielle collection featuring unique imported linens with hand-embroidered Navy Blue honeycomb pattern on a translucent batiste panel—presented on 600-count percale. 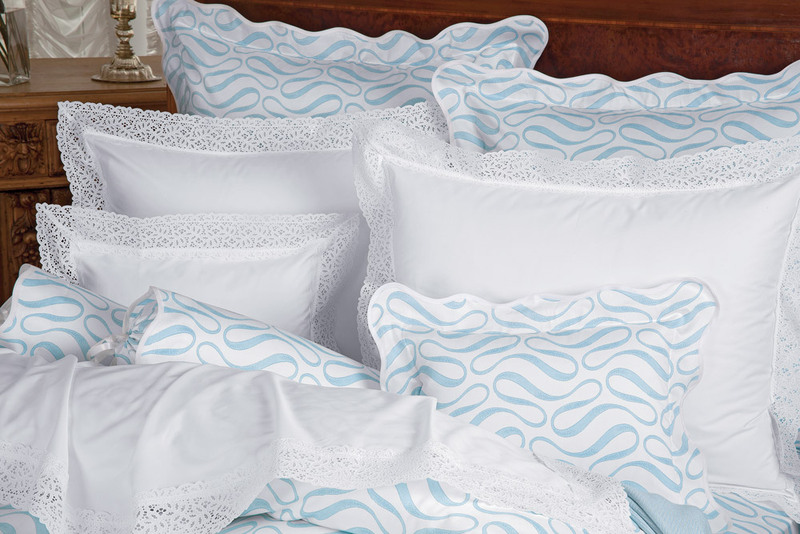 Everything is instantly more gorgeous when this bedding is in view. The truly joyful love life and love sharing it with others. They easily find things to smile about and don’t let the little things in life bother them. Our designs and fabrics are designed to inspire happiness every day and to help you find those special moments of joy where we are fully present in realizing that life is indeed an incredible gift. It’s all in the name. The Jubilation collection features an ecstatic flourish of Aqua or Orange streamers on lustrous 300-thread count White Egyptian cotton sateen to uplift tired spirits with an energetic happiness that stays with you all day long. Impeccably made in Italy with beautiful piping on gently scalloped flanges. With the look and feel of a treasured heirloom, the heart-like appliqué is hand sewn with exquisite care along the flange and is sure to fill your bedroom (and heart) with feelings of pleasure and elation. Features smoke blue appliqué on crisp, white 600 thread count Egyptian cotton percale for unparalleled comfort. Derived from the 600-year art of glazed Azulejo tiles in Portugal, the joyous decor of our Azulejo collection is a reminder of the beauty and magic that fills the world. Lovely Pinks and Blues trigger natural feelings of happiness and the Italian-made 300 thread count Egyptian cotton sateen with detailed embroidered cording always leaves you with something to smile about.